Abuja - The leader of a pro-Biafran group that wants to break away from Nigeria failed to appear in court on Tuesday as his treason trial was scheduled to resume. Nnamdi Kanu, who heads the Indigenous People of Biafra (IPOB) movement, was nowhere to be seen as proceedings resumed at the Federal High Court in the capital, Abuja. Prosecutor Shuaibu Labaran said Kanu's absence was "contrary to the order of this court" but the separatist leader's lawyer, Ifeanyi Ejiofor, said: "I don't know where my client is. "The home of the first defendant (Kanu) was invaded by soldiers and since that time I have not heard from him. I cannot tell... whether (he) is alive or dead." Ejiofor also suggested Kanu was "in the custody of the (federal government)". Judge Binta Nyako adjourned the case until November 20, pending more information as to Kanu's whereabouts. 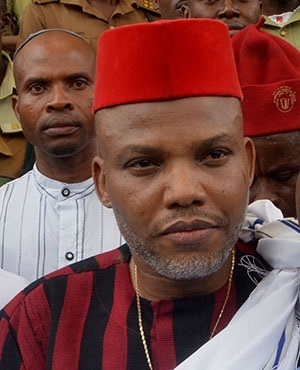 Kanu and three other defendants, who were remanded in custody, are facing several charges linked to his calls for a separate state for the Igbo people, the majority in Nigeria's southeast. He was first arrested in October 2015, stoking grievances that have festered since a previous declaration of independence in 1967 sparked a bloody, 30-month civil war. The conflict left at least one million people dead, most of them Igbos from the effects of starvation and disease, as federal forces blockaded the fledgling state. Kanu, who also runs the London-based Radio Biafra station, was released on bail in April this year on health grounds but under strict terms. The judge ruled that he should not attend any rally, be in a crowd of more than 10 people or give any media interviews while on bail. He was ordered to pay sureties totalling $835 000 to ensure his attendance at trial. Ejiofor told reporters at the time they were "very sure we will fulfil the conditions for bail". But since then, Kanu has rarely been out of the spotlight. He told AFP in an interview in May to mark the 50th anniversary of the declaration of independence that he was "more determined than ever" to secure a breakaway republic. He also called for "civil disobedience" until a referendum was granted on self-determination. Kanu's whereabouts have been the source of increasing speculation in recent weeks, after a military surge in his home city of Umuahia and the surrounding area. The IPOB leader's younger brother, Prince Emmanuel Kanu, said the army attacked the family's compound last month, killing 28. The army has denied the claim and also that they were holding Kanu, but their tactics come in for criticism for fueling tensions in the restive region. Comparisons have been drawn to Boko Haram's founder Muhammad Yusuf, who died in custody in 2009 during a military crackdown in the northeastern city of Maiduguri. "If anything happens to him (Kanu), the reactions are likely to be very violent in the southeast," said security consultant Don Okereke.